This Northern League goalkeeper scored a last-gasp equaliser... for the second time in two weeks! Jordan Nixon of Guisborough Townis making a habit of scoring dramatic lategoals. It's not often you hear about goalkeepers scoring at any level but this Northern League number one can't stop finding the net! Jordan Nixon of Guisborough Town is making a habit of scoring dramatic late goals to emerge as an extremely unlikely hero. Two weeks ago, the Priorymen were frantically searching for an equaliser in their FA Cup Extra Preliminary round tie at home to Newton Aycliffe. And up popped Nixon in the fourth minute of injury time to level the score at 3-3 and send the fixture into a replay, which Guisborough won 2-0. And if Nixon thought his life had peaked then, well how about now? This time in league action, Hebburn Town led 3-2. Nixon pushed forward... surely not again? 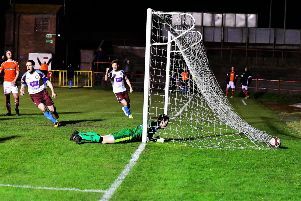 Nixon found himself in the right place at the right time as the ball fell perfectly to the goalkeeper before producing a striker's finish into the bottom corner. Prolific. "I might be the first ever goalkeeper to have a goal bonus in my contract," the former Middlesbrough man joke when speaking BBC Tees. Guisborough return to FA Cup action when they host Evo-Stik Premier side Farsley Celtic at the King George V Ground on Saturday.